Like yoga but with a stick, Bo Yoga combines elements of yoga with a bo, a wooden staff used in the Japanese martial art of bojutsu. Those familiar with yoga may recognize hints of familiar poses like table or warrior, but it is a unique discipline, incorporating tai chi and dance. Nate Guadagni, founder and instructor of Bo Yoga, says he came up with the idea while trying out different kinds of bo staffs. “I realized it allowed me and my students to do a lot more,” Guadagni says about the plastic-and-foam bo he uses in class. “The bo staff allows you to use leverage.” And that means it is possible to stretch more deeply with less effort and strain. The practice is particularly helpful for people recovering from injuries, he says, as well as improving balance and self-discipline. On a recently rainy morning, Guadagni led a small class of students at the Core Star Center near downtown Eugene. Soft music fills the room as everyone stretches. At first, the bo staff feels awkward, but at the front of the room, Guadagni demonstrates. He shows the class how to place the staff across the shoulders, arms looped over the top. Next, he puts one end of the staff on the ground and leans against it, encouraging everyone to follow suit. After stretches, he moves to the upper body. With deft movements, he swings the bo in a figure eight around his body. 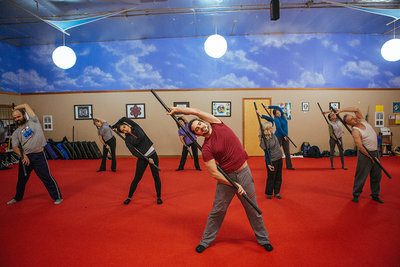 The students imitate the movement, with an occasional bo staff falling to the floor. This is when the soft padding that encases the bo becomes important. Now to the lower body. He explains that most people need to strengthen their hips and legs, so this part of the routine is more rigorous. Extending arms and legs in a series of kicks, Guadagni urges everyone to hold the pose to the count of ten, balancing against the bo. The class wraps up with the students lying on the floor, feeling energized and relaxed at the same time. Bo Yoga is more than exercise for the body; it has a mental and emotional component as well, helping to relieve stress and anxiety. Guadagni says he is working on an e-book and a series of DVDs to complement the practice of Bo Yoga and help people learn at home. Classes are currently offered in Oregon and Illinois.